In recent news portal 'Stomp' in Singapore, an article titled "Principal stalks ex-students on FB and says their photos are 'nice', 'cute' and 'pretty'" was published. The principal is found by another media portal "The Temasek Times" to be SSA Current Youth Chief, Leonard Koh Yiak Kheng, the current principal of Northland Secondary School who was in the news for allegedly ‘stalking’ ex-students on Facebook. 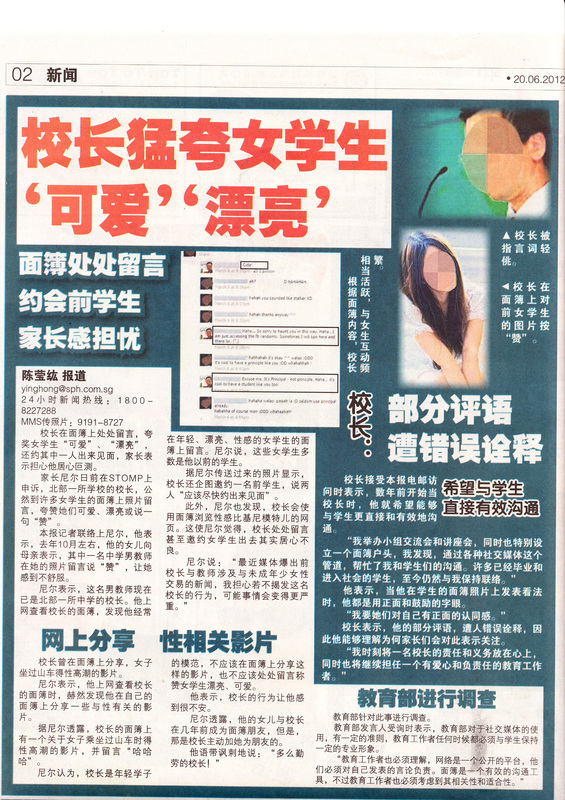 In the media portal, there was a report containing over 100 snapshots of Leonard Koh’s ‘interaction’ with his ex-students on Facebook including the ‘interesting’ pages and posts he liked and shared his visits to Wet & Wild Bikinis and Swimwear Model Facebook pages. In many of the posts, Leonard Koh posted ‘nice’ on the photos of his ex-students some of whom were surprised at his comment. When asked how he found them on Facebook, he replied that he surfed it ‘randomly’. While the comments were not crude or lewd, something is not right somewhere when an educator actively seeks out his ex-students (not only one, but more than a hundred and more) on Facebook with the intention of asking them out.